With its steel legs and L-shaped table top, the Merax computer corner desk is a stylish, compact solution that will easily fit in with your existing décor. Constructed from a high-quality laminated MDF, which gives the desk a strong and sturdy structure, the powder-coated steel frame has been given additional vertical design detail, which adds to its striking appearance. Shown here in the most attractive oak finish, this is a very desirable piece of office furniture. The generous proportions of this desk are 59 inch wide by 55 inch long, and the innovative reversible design means that the computer can be set either on the right or the left, offering flexibility to suit your space. The height is a good 29.9inch, providing plenty of leg room. 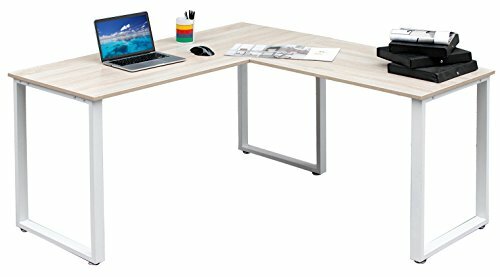 Monarch Metal Computer Desk, Dark Taupe/Silver, 60"